Play is a universal activity necessary for healthy brain development. Play is defined as a spontaneous, naturally occurring activity with objects in the environment that engages attention and interest. Physical play affords a child the opportunity to be active, problem solve, create, communicate and learn about social roles. Play provides opportunities to experiment with everything from cause and effect to higher-level play with object representation and multiple roles. Typically, developing children learn sensorimotor rules and progress cognitively from concrete to relational to functional to creative play. This is developed through exploration with their environment. Exploration requires access. When children are unable have access to participate independently in play experiences, their learning will be greatly affected. A deficit in motor skills will decrease participation and may cause a developmental delay. This leads to a limitation in their pretend play, which ultimately impedes their learning. 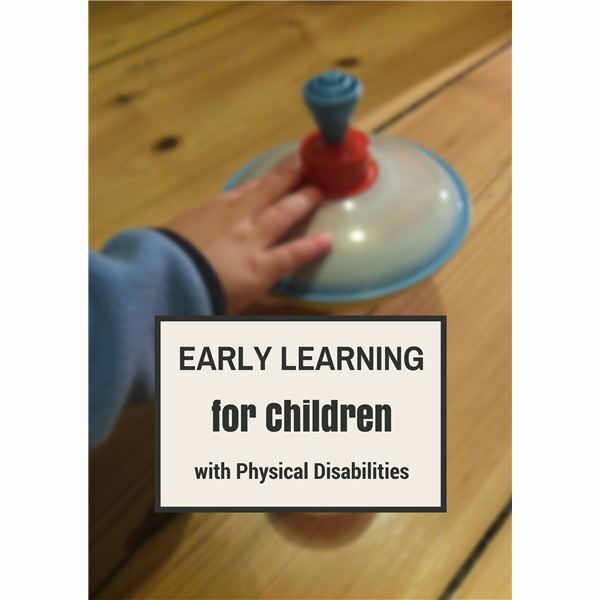 How can early learning through active play be supported and developed for children with physical disabilities? What can teachers and therapists do to decrease the gap between typical and atypical children and their cognitive growth and development? Experts recommend that children with disabilities play with toys that afford opportunities for motor development through early intervention. These toys must provide exploration and engagement using adaptations or modifications. Interventions should be task-specific and based on functional and environmental perspectives that are family centered. Interventions must be part of daily routines and not separate, distinct activities that do not relate to the child’s everyday life. Due to physical, sensory, cognitive or linguistic barriers, a curriculum that is effective for some children may not be effective for all. For a curriculum to be accessible to all, every aspect of the curriculum (the environment, activities, instructional methods, materials, etc.) must be inviting and conducive to active participation of all children, regardless of disability. Varying content, adapting materials and toys and modifying instructional strategies are all ways to make the curriculum accessible to children with disabilities. Multiple means of representation: This refers to the instruction and learning opportunities being presented in a wide array of formats and at various levels of difficulty. In this way, it addresses all ability levels and learning styles (visual, auditory, kinesthetic, etc.). When multiple means of expression are provided, differentiation of instruction is embedded and naturally occurring and allows each child to participate most effectively. Examples include collection of books ranging from easy to more challenging, providing pull-apart toys (bimanual) of handing two objects to children who need encouragement for the use of two hands at the same time. Multiple means of engagement: This refers to various opportunities presented to interest the children, pique their curiosity and motivate their desire to learn. Scaffolding, repetition and challenge ensure quality learning. Since children’s interests and abilities vary, the curriculum must be flexible and may change according to the changing child. Pre-contrived themes or strict lesson plans are not ideal due to the limitations placed on individual learning or interests of the children. It must appeal to children of all abilities, developmental levels and preferences. Examples include a balance between open-ended materials and activities with more structured options in which the child can choose where they would like to play. Supports such as handles on a puzzle or a choice between playing with cars and playing with animals gives the child independence and will allow for more authentic, meaningful learning opportunities. Multiple means of expression: This allows the children to show what they know through multiple means. Their responses, expression of personal thoughts and feelings, choice of activities, materials and learning topics are all ways this principal individualizes learning according to strengths, preferences and abilities. Children can communicate their wants or needs through a wide variety of verbal or non-verbal options, including: signs, gestures, pictures, objects, art or assistive technology. It is paramount to remember the critical role adults play in the fostering of active learning in young children. Responding to, expanding and supporting their play and communication allows for growth in cognitive development. Children must have opportunities for physical movement and access to play materials. They must have multiple means for gaining knowledge, interacting with the material, and communicating what they know to experience success within the play environment. It is crucial for adults to create a curriculum framework grounded in the concept of universal design that incorporates comprehensive, flexible learning opportunities that are individualized for ability and interest. NAEYC and NAECS/SDE. (2003). Early childhood curriculum, assessment, and program evaluation: building an effective, accountable, system in programs for children birth through age 8. Retrieved from http://www.naeyc.org/about/positions.asp on February 3, 2016. DEC. (2007). Promoting Positive Outcomes for Children with Disabilities: Recommendations for Curriculum, Assessment, and Program Evaluation. Missoula, MT:Author. Bailey, D. & Wolery, M. (1984). Teaching Infants and Preschoolers with Handicaps. Lifter, K. & Bloom, L. (1998). Object Knowledge and the Emergence of Language. Infant Behavior and Development, 12, 395-423.